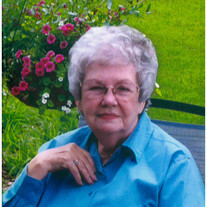 Obituary for Lillian Lee Elkins | Langeland Family Funeral Homes, Inc.
Lillian passed away on July 4, 2018 after 92 beautiful years of living, loving, sharing and caring. She was born in Reeds Spring, Missouri on March 12, 1926 to Edward M. and Sarah E. (Fly) Perkins as the oldest of four daughters. She married the one and only love of her life and father of their four children, Donald L. Elkins on January 29th, 1944. They moved to Kalamazoo, MI in 1950 and made this home for the rest of their lives. Lillian is survived by her children Sharon and James Staley, Beverly McKinney, Jerry Elkins, and Patti and Mike Petersen, and also daughter-in-law Sheila Guarisco. Grandchildren are Robyn Burlingham, Randi McKinney, Julie and Steve Gruber, Jennifer and Andre Reinert, Michael and Melissa Elkins, Ashley Elkins, Jamie Raymond, Lacy Petersen, Sean Wallace, Jeremy Raymond, and David Newman. Great-Grandchildren are Jessi & Matt Goldner, Kaytlin & Loyal Perry, Morgan Mendez, Logan Mendez, McKenna Burlingham, Seth, Jon, and Sarah Gruber, and Oliver Raymond. Great Great-Grandchildren are Brayden Herr, Kendall & Brooklyn Goldner, Parker & Mason Mendez, and Loyal Perry V.
She is survived by Bonnie and Doug MacDonnald. Bonnie is her sister, confidant, and best friend and as they put it, they were "in and out of peril together." Doug is the brother she always wanted and was fortunate to get to call family when her sister Bonnie and he were married. Lillian is also survived by her other sister Betty and Louis White as well as her Step-brothers and sisters: Joe and Bobby Tittsworth, Merel Back, Ruth Senior, Geraldine Leckron and Peggy Reynolds, and many cousins, nieces and nephews. She was preceded in death by her husband, Don, in 2007 after nearly 64 years of marriage. Also a grandson Jon Raymond Staley, Mother and step-father George Koeneman, Father and step-mother Irene Perkins, sister Lea Ellen Williams and step-brother Carrel Tittsworth. Outside of her family, Lillian was particularly proud of her involvement with her Glee Club at 15 years old, when they sang "Beautiful Isle of Somewhere" in a competition and won first place. Another proud moment was when she retired from J.C. Penney in 1984 after working many years in the Downtown Kalamazoo store and opening the West Main store. If asked, Lillian would tell you she enjoyed spending time with family, sewing, making quilts and crocheting afghans for family and friends, working in the yard and flowers, camping, traveling, and the twelve winters spent in Florida with Don and the many friends they made there. However, as I looked at Granny's hands last night, I remembered how she would hold our hands when we rode the bus downtown to spend the day with the last business of the day being a trip into Woolworth's to buy us a bag of candy. Her hands held each of the babies as their family grew. I remember her stitching each quilt block by hand and then hand tying each quilt carefully, precisely, beautifully. I remember her cooking, the homemade pies and cobblers, the homemade bread and preserves (canned by her), the homemade sausage gravy made from scratch, and clothes she sewed for her own children and us grandchildren, the many beautiful afghans she crocheted for so many. I remember her always writing to her mother, sisters, and friends. She wrote countless letters as did they back. I could sit forever watching her draw flowers especially dogwoods which were her favorite. She loved her many flowers and even when she couldn't be outside weeding them anymore, would stand in the window of her modest little home with knotty pine paneling, that she loved from the moment they found the house, and admire the colors and beauty of the flowers that surround their home. I remember her hanging clothes to dry in the backyard and how good they smelled as she took them down and folded it all. There was the meticulously wrapped Christmas presents, each with a bow, that she'd place under the Christmas tree with each ornament carefully placed for a beautiful display making each and every Christmas special. There are so many more memories of Granny, the care and pride that she put into everything she did, and her many, many talents and accomplishments of which simply cannot be summed up here. The things about Granny that outshines all of her many talents is her beauty, inside and out, huge heart of gold and the love that she shared with all of her family. She touched every one of us around her with her sweet smile, kind heart, and gentle hands. Lillian would say she wasn't perfect, but she was the best wife to Don, and the best Mom and Granny to the rest of us. We miss you already. Have a sweet journey home.